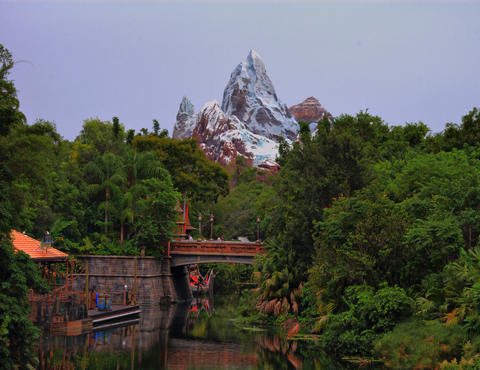 Before 9:30 a.m., or after 3 p.m., or use FastPass+. 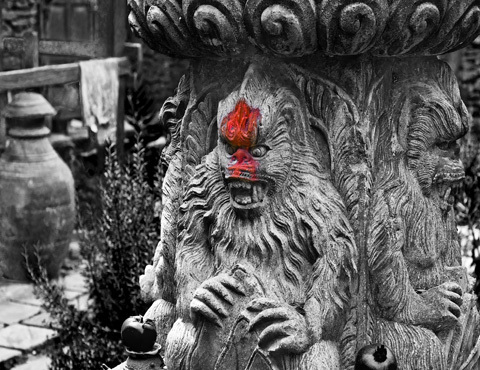 The first true roller coaster in Animal Kingdom, Expedition Everest begins with an elaborate waiting area modeled after a Nepalese village; then you board an old train headed for the top of Mount Everest. Throughout the waiting area are posted notes from previous expeditions, some with cryptic observations regarding a mysterious creature said to guard the mountain. These ominous signs are ignored (as if you have a choice! ), resulting in a high-speed encounter with the Abominable Snowman himself. The ride consists of tight turns (some while traveling backward), hills, and dips, but no loops or inversions. 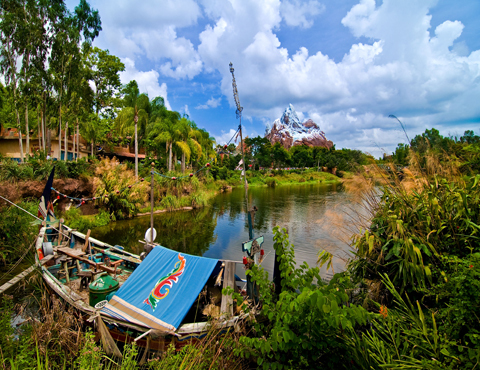 From your departure at the loading station through your first high-speed descent, you’ll see some of the most spectacular panoramas available in Walt Disney World. On a clear day, you can see the buildings of Coronado Springs Resort, Epcot’s Spaceship Earth, and possibly downtown Orlando. But look quickly, because you’ll immediately be propelled, projectile-like, through the inner and outer reaches of the mountain. The final drop and last few turns are among the best coaster effects Disney has ever designed. The coaster reaches a top speed of around 50 mph, just about twice that of Space Mountain, so expect to see the usual warnings for health and safety. The first few seats of these vehicles offer the best front-seat experience of any Disney coaster, indoor or out. If at all possible, ask to sit up front. Also, look for the animal poop on display in the FastPass+ return line—a deliberate attempt at verisimilitude, or did Disney run out of money for ride props and use whatever they could find? You decide. 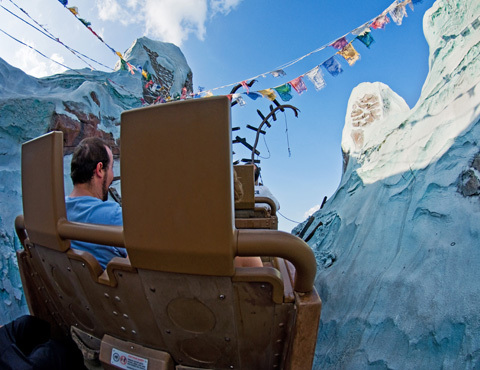 Ride Everest as soon as the park instead of using FastPass+ This way you can save your reservations for other attractions or another Everest ride later. In the latter case, try riding during the last hour the park is open, or use the single-rider line. This chart shows you roughly how long you'll wait for Expedition Everest - Legend of the Forbidden Mountain when you visit on a day with a given Disney's Animal Kingdom Crowd Level. The blue bars represent the average "peak" wait time (that is, how long the line will be at its busiest). The bottom and top black lines represent the range of peak wait times to expect (for you fellow nerds out there: it's the 5th percentile and 95th percentile of peak wait times). 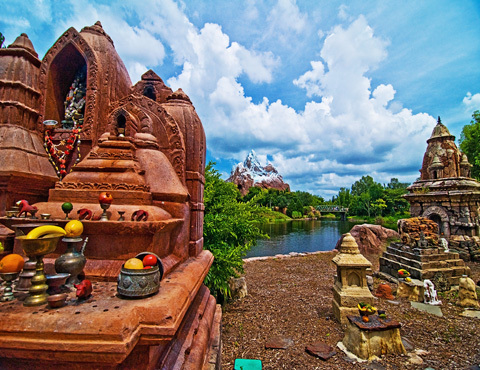 Please note that these are estimates, and for a better forecast for your travel dates, see Expedition Everest - Legend of the Forbidden Mountain Wait Times. This attraction has a minimum-height requirement of 44 inches. 44-inch minimum height requirement. Switching-off option provided.